Our lives, shared with you. Home > Fill-In Formal Invitations Are Always En Vogue! Fill-In Formal Invitations Are Always En Vogue! We’re feeling especially “old school” about party invitations. 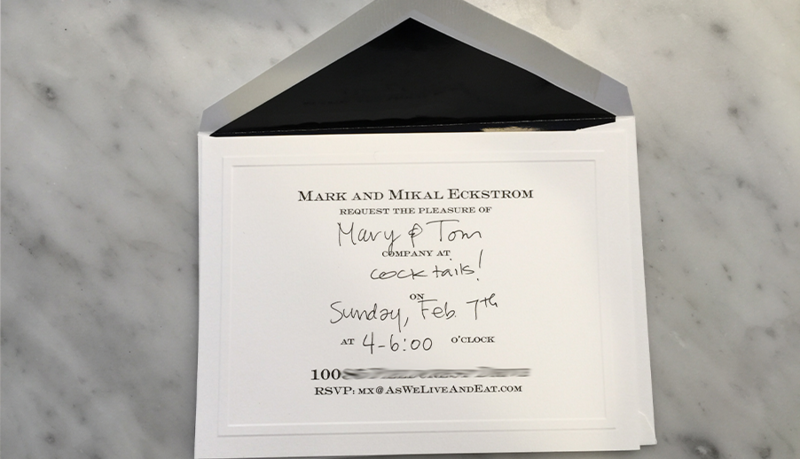 Yes we’ve designed invitations for special events; but, we feel as though things have become a bit too informal in our high-tech and social media saturated world. Sending a text or Facebook message as a dinner invitation is used more often than we’d care to admit. We know everyone is busy and the post, at times, is unreliable and requires pre-planning. But isn’t an invitation received in the mail remarkably special? In our yearning for the niceties of our parent’s and grandparent’s era—a time when formal invitations were the norm—we went straight to Emily Post for a primer on designing a proper invitation that we may use for various occasions. Emily Post’s Etiquette devotes an entire chapter on “Invitations and Replies” that we referenced in designing our “Fill-In Formal Invitation” for print. We’ve included a copy of our invitation below (our address is naturally obscured to discourage stalking *grin*). We used Stationery Studio for printing—their work is beautiful, fast, inexpensive, and très chic! Remember that you must provide every guest with an invitation (don’t cheap out with close friends or neighbors)—think égalité! If the invitation requests an R.S.V.P., you must respond! If you do not accept and say you are “out of town”, ensure that you are actually out of town and not attending a better invitation. The world is small and it will surely make your hosts or hostesses sour. Thank you so much for mentioning The Stationery Studio and the invites are gorgeous! (c) 2104-2015 ASWELIVEANDEAT.COM. ALL RIGHTS RESERVED.